The policy shift impacts thousands of students at 34 schools across San Jose and Campbell. Sweeping changes governing the use of police officers at dozens of South Bay schools will go into effect this year as part of a pilot program after an NBC Bay Area investigation revealed students were being left with criminal records for what many describe as childish misbehavior. The policy shift impacts 3 school districts, serving over 67,000 students across San Jose and Campbell. The changes come in response to a year-long Investigative Unit series, which revealed schools summon police officers to address behavioral and safety issues at disproportionately high rates when the situations involve students with disabilities or minorities. There are six school districts in the South Bay that contract with the San Jose Police Department to place officers on campus. As a result of the reporting from the Investigative Unit, the San Jose Police Department now plans to unveil detailed job descriptions for its campus officers during the upcoming school year. The guidelines will be implemented as part of a pilot program at 34 schools across three school districts: Campbell Union High, East Side Union High, and San Jose Unified. “I think it just makes things a lot easier for the officer and then also the administrator and letting them know what our role is at the school,” said San Jose police Sgt. Jason Pierce, who helps train roughly 120 officers in the department who regularly patrol schools. Pierce said school administrators have historically relied too heavily on police to discipline students. “I think that’s just because there is a lack of education on their part and what our role is on that campus,” he said. Pierce said the lack of a clear and written policy has led to an unstandardized discipline system, where some students may get sent to the principal’s office for committing the same type of misbehavior that left other students with criminal records. The San Jose Police Department acknowledges that such a policy change would have prevented certain students from landing criminal records for misbehavior that some describe as just childish misbehavior. Last year, the Investigative Unit spoke to Adrian Crosby, a 13-year old San Jose Unified student with autism who attended Bret Harte Middle School. Campus administrators summoned a school officer after Crosby used a rock to scribble his initials on a sidewalk in front of the school. “I thought maybe someone might look at it and say, ‘oh, look, a legend, this is so cool – a legend was at this school,’” Crosby said. A San Jose police officer wrote him up for vandalism and threatened to put him in handcuffs. Crosby’s initials washed off with water, but he still received a juvenile citation, which left him with an arrest on his criminal record. “People are on different pages when it comes to citing individuals and for what types of crime,” Pierce said. East Side Union High School District, which serves roughly 26,000 students at seven high schools, is leading the charge in the South Bay to define the roles and responsibilities of campus police officers. At a November school board meeting, Funk credited reporting by the Investigative Unit when he unveiled a new district-wide discipline policy to dramatically limit when his school administrators should involve law enforcement. Assault or brandishing a weapon are still listed as appropriate reasons for schools within the district to contact law enforcement, but under the new guidelines students smoking cigarettes or using profanity are now examples of misbehavior that school administrators or counselors should handle. Funk said he hopes the changes will improve relationships with law enforcement, since he believes neighboring communities have been traditionally pitted against the police. The district has come a long way since the 2011-2012 school year, when it referred 1,745 students to law enforcement. Out of more than 16,000 school districts in the entire country, the district ranked 14th in how often it called police on its students. That number has since dropped dramatically. During the 2014-2015 school year, the school district referred 184 students to law enforcement. “The statistics are very clear … any time a student is suspended from school expelled from a district or enters the justice system, they are less likely to graduate from high school,” Funk said. 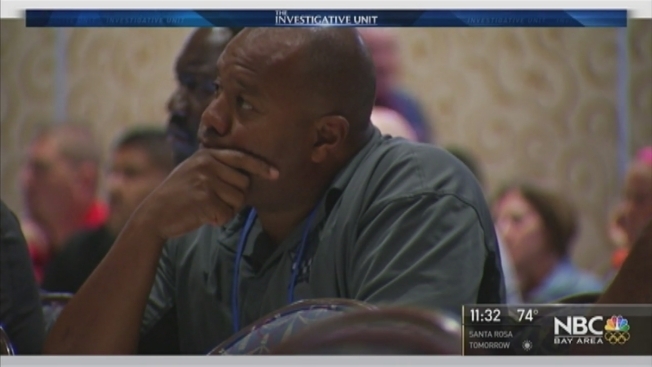 In June, The San Jose Police Department sent Pierce and other instructors to Anaheim to receive 40 hours of training in school-based policing. Last year, the Investigative Unit revealed that while the Department of Justice recommends those 40 hours for school officers, San Jose Police only requires 30 minutes of training every two years. Beginning in September, the police department plans to begin mandating at least 3 hours of training for its school officers.